At Everything that has rank and name comes to wire. The technical buyers, financially strong investors and good customers, who are attracted to Düsseldorf on five days of the fair. Meet your business partners at the world’s most important trade show for the wire and cable industry. This is where the shops are made, where valuable contacts are made and cared for, and here you can see the world news that will be talked about tomorrow. Whoever wants to or wants something is on the wire. You should be too! Wire and cable machines, wire and cable production, trade with these materials as well as fibre glass technologies, mesh welding machinery, spring making, fastener technologies and the China Pavilion meet china’s expertise were presented in exhibition halls 9 to 16. A total of 1,442 exhibitors from 53 countries showcased their innovations on space exceeding 65,000 square metres. 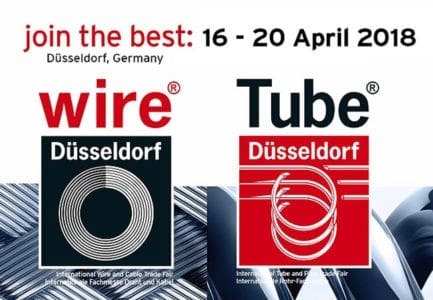 Most wire exhibitors came from the major producer countries Italy, Germany, Turkey, Great Britain, France, Spain, Austria, the Netherlands and Switzerland. From overseas many exhibitors from the USA, India, Taiwan, South Korea and China travelled to the exhibition halls on the Rhine.